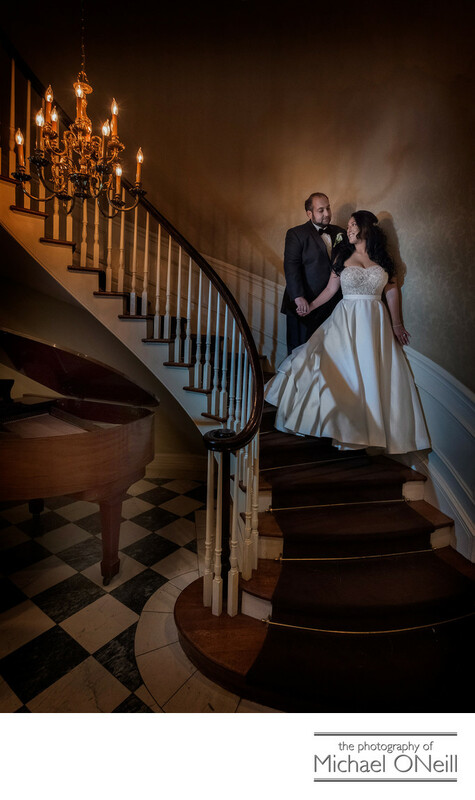 Yet another elegant full length bridal portrait taken on the beautiful spiral staircase in the lobby of the Royalton Mansion at Roslyn Country Club in Nassau County, Long Island. I exclusively photograph luxury weddings in some of the most prestigious venues in the New York Metropolitan area and the Royalton Mansion is certainly one of them. It is on par with some of Long Island’s other landmark Gold Coast properties including Oheka Castle in Huntington NY, The deSeversky Mansion on the campus of NYIT and the Glen Cove Mansion. It rivals, in the quality of food and service any of the finest hotels in NYC…The Plaza, The Parklane, The Waldory-Astoria and The Ritz Carton Battery Park. The Royalton Mansion caters to only one event per day and the bride and groom are given unlimited access to all of it’s amenities. The bride has a spacious bridal suite with dressing areas and a private bath at her disposal. There is a second suite for the groom, his best man and the groomsmen. There is a third room/lounge at the couple’s disposal where they can entertain friends and family. All of this is located on the second floor before you descend to the glorious main ballroom, the dedicated room for the cocktail hour and multiple outdoor gardens where you can have your wedding ceremony, outdoor cocktail reception and numerous spots to take beautiful outdoor wedding pictures. If you are planning a luxury Long Island LI wedding you owe it to yourself to visit the Royalton Mansion and consider this fine establishment as the venue for your perfect wedding celebration. While you’re at it give me a call. I would love to collaborate with you on making your photographic memories of the big day perfect.